DRAFT COVERAGE: Even though they had the last pick in the first round of the 2012 NHL Entry Draft, the Los Angeles Kings added six prospects to the fold this weekend. Also: news on veteran player signings, and an upcoming change to the coaching staff. LOS ANGELES — Despite having the last pick in the first round of the 2012 National Hockey League Entry Draft, the Los Angeles Kings were busier than expected this past weekend. After winning the 2012 Stanley Cup, the Kings earned the “privilege” of selecting last in first round of the draft. In spite of that disadvantage, they managed to add six prospects to their system, and they reached agreements in principle with two of their veteran forwards who would become unrestricted free agents on July 1. Center Jarret Stoll will sign a three-year contract extension that will pay him an average of $3.25 million per season, while center Colin Fraser will sign a two-year deal that will pay him $825,000 per season. Stoll was at the end of a four-year deal with an annual cap hit of $3.6 million per season. He earned $3.4 million in 2011-12. Fraser’s two-year deal earned him $825,000 in 2010-11 and 2011-12. 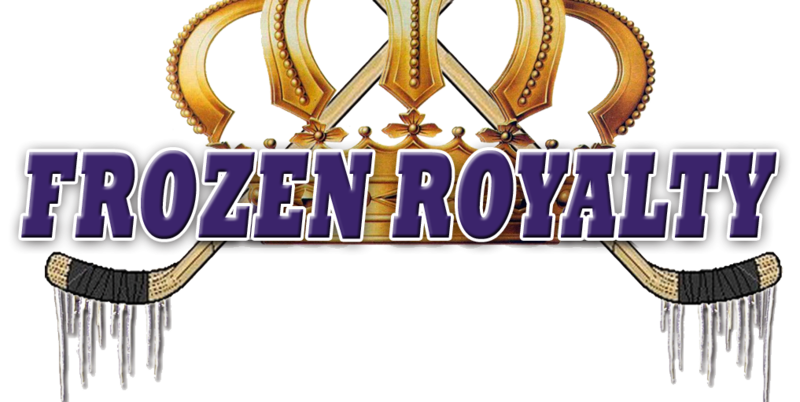 Frozen Royalty has also learned that Kings assistant coach Jamie Kompon will not return to the team once his contract expires on June 30, 2012. Although he has not announced his plans for next season, former Kings great Bernie Nicholls, who worked with the team without a title this season, could return, perhaps as an assistant coach. When asked specifically about if he would accept an offer to become an assistant coach, although he did not commit himself, he did not reject the idea. Note: The Kings made Co-Director of Amateur Scouting Mike Futa, President/General Manager Dean Lombardi, and their first round pick (details below), available only to a very select number of media outlets this weekend (at this point, it appears that only lakingsinsider.com and the Los Angeles Times were invited to speak with them). As such, Frozen Royalty is unable to bring you their comments, either about the personnel moves reported above, or regarding the 2012 NHL Entry Draft. During the first round of the 2012 NHL Entry Draft in Pittsburgh on June 22, the Columbus Blue Jackets had the option of taking the Kings’ first round pick this year, as part of the trade that brought forward Jeff Carter to the Kings, in exchange for defenseman Jack Johnson and a conditional first round pick. But, as expected, they chose to take the Kings’ first round pick in the 2013 NHL Entry Draft instead, gambling that the pick will be higher than in this year’s draft. With their first round pick (30th overall), the Kings selected left wing Tanner Pearson (Frozen Royalty’s projected pick for the Kings). Pearson, who turns twenty years old on August 10, played the last two seasons with the Barrie Colts of the Ontario Hockey League. In sixty games this season, he scored 37 goals and added 54 assists for 91 points, with a +21 plus/minus rating, and 37 penalty minutes. Pearson, who ranked third in the OHL in overall scoring, led the Colts in goals, assists and points. The 6-0, 198-pound native of Kitchener, Ontario scored 15 goals and tallied 27 assists for 42 points with 35 penalty minutes in the 2010-11 season. He also represented Canada at the 2012 World Junior Championships, where he scored a goal and contributed five assists for six points, helping lead Canada to the Bronze Medal. Pearson, who was draft-eligible two seasons ago, was not selected in 2010 or 2011. He was ranked 25th among North American skaters by the NHL’s Central Scouting Bureau (CSB). The Kings’ second round pick (61st overall) went to the Philadelphia Flyers in the June 23, 2011 trade that also sent forwards Wayne Simmonds and Brayden Schenn to the Flyers in exchange for center Mike Richards and the rights to forward Rob Bordson (who was not signed by the Kings). One of the Kings’ third round selections (66th overall), which was originally acquired from the Toronto Maple Leafs on June 26, 2010, in exchange for a third round pick in the 2010 NHL Entry Draft, went to the Nashville Predators on June 25, 2011, in exchange for a third round selection (Nick Shore), and a sixth round pick in the 2011 NHL Entry Draft. Their other third round pick (91st overall) went to the Edmonton Oilers, along with defenseman Colten Teubert, and a first round pick in the 2011 NHL Entry Draft on February 28, 2011, in exchange for left wing Dustin Penner. Left wing Nikolai Prokhorkin was the Kings’ fourth round selection (121st overall). The 18-year-old has played the last two seasons with CSKA Moscow in the Kontinental Hockey League (KHL), as well as CSKA Moscow in the Russian junior league. In the KHL, the 6-2, 191-pound native of Chelyabinsk, Russia, was limited to a goal and an assist in 15 games in the 2011-12 season, due to injury. He played just six games with the KHL club in 2010-11. With the junior team, Prokhorkin scored 23 goals and tallied 17 assists for 40 points with 42 penalty minutes in 46 games in the 2010-11 season. He played in just 15 games this season, scoring nine goals and contributing 17 assists for 26 points with 47 penalty minutes. Prokhorkin, a skilled playmaker, turns 19 on September 17. He was ranked ninth among European skaters by CSB. Defenseman Colin Miller, another “over-ager,” was the Kings’ fifth round selection (151st overall). The 19-year-old, 6-1, 175-pound native of Sault Ste. Marie, Ontario, played the last two seasons with the Sault Ste. Marie Greyhounds of the OHL. This season, Miller, who participated in the Kings’ annual development camp and rookie camp last summer, scored eight goals and added twenty assists for 28 points with a +9 rating and 79 penalty minutes in 54 games, improving upon his 2010-11 numbers: three goals and 19 assists for 22 points with 44 penalty minutes in 66 games. Miller, who plays on the right side, was ranked 148th among North American skaters by CSB, quite the jump from his midterm rank of 191. He turns 20 on October 29. The Kings acquired a sixth round pick (171st overall) from the Flyers, along with forward Stefan Legein, in exchange for future considerations, on October 12, 2011, and they used that pick to select right wing Tomas Hyka. Coincidentally, Hyka, who was not selected in the 2011 NHL Entry Draft, participated in the Flyers’ training camp this season, but returned to his junior team, the Gatineau Olympiques of the Quebec Major Junior Hockey League (an agreement prevents undrafted European players from signing with NHL teams before they reach 22 years old), where he scored twenty goals and added 44 assists for 64 points, with a +14 rating and thirty penalty minutes. He led Gatineau in goals, assists, points, and plus/minus. The 19-year-old, 5-11, 160-pound native of Mlada Boleslav, Czech Republic, also represented his country at the 2012 World Junior Championships, where he recorded two assists in five games. Hyka was ranked 45th among European skaters by CSB, a significant improvement from his midterm rank of 65th. With their own pick in the sixth round (181st overall), the Kings selected defenseman Paul Ladue of the Lincoln Stars in the United States Hockey League. Another “over-ager,” Ladue, who will turn twenty years old on September 6, scored nine goals and added 25 assists for 34 points, with a +36 rating and 27 penalty minutes this season. The 6-1, 186-pound native of Grand Forks, North Dakota, led all USHL defensemen in plus/minus, and tied for sixth among USHL defensemen in overall scoring. Ladue, who plays the right side on defense, will play for the University of North Dakota next season, joining Kings defenseman prospect Derek Forbort, who was selected by the Kings in the first round (15th overall) of the 2010 NHL Entry Draft. Ladue was not ranked by CSB this season. The Kings acquired a seventh round pick (183rd overall) in this year’s draft, along with center Colin Fraser, from Edmonton, in exchange for left wing Ryan Smyth, on June 26, 2011. On June 23, they traded that pick to the Dallas Stars for a seventh round selection in the 2013 NHL Entry Draft. The Kings used their own pick in the seventh round (211th overall) to select defenseman Nick Ebert, 18, a 5-11, 205-pound native of Red Bank, New Jersey. Ebert played the last two seasons with the Windsor Spitfires of the OHL, scoring six goals and adding 33 assists for 39 points with 58 penalty minutes in 66 games this season. He led Spitfires defensemen in scoring and assists. In the 2010-11 season, Ebert scored eleven goals and tallied thirty assists for 41 points, with 44 penalty minutes in 64 games. Ebert was ranked 96th among North American skaters by CSB, quite the drop from his midterm rank of 70. All videos provided by KingsVision at LAKings.com, or NHL.com require Adobe Flash Player. As such, they are not viewable on iOS devices (iPhone, iPad, iPod Touch). ©2012 National Hockey League. Used with permission. I’m happy that the Kings are bringing back Stoll. Even though I thought he had a sub-par regular season, he was definitely instrumental in the playoffs and I believe will be a factor in next season’s playoffs as well. However I’m now very concerned about Loktionov. I still don’t believe we’ve truly seen what type of player he will amount to when given a full season as a center. I think that Lombardi will be forced to trade him now that there is no room for him and we’ll be lucky to get close to his value as an asset. I certainly don’t think he’ll be content waiting in Manchester for someone to get injured. I just have a bad feeling we’re going to be watching another Moulson get away. Stoll is their best face-off man, and a very solid third line center. He is very well-suited to that role, as opposed to playing on the first or second lines. Loktionov isn’t someone you should be concerned about. He has skill, but, based on what I’ve seen, I don’t think he has the mindset to play in the NHL on a regular basis. He doesn’t seem to be capable of handing the physical or defensive aspects of the NHL game. I could easily be wrong (wouldn’t be the first time), but that’s my view of Loktionov. There’s no place on the Kings’ roster for him now, and maybe not for awhile. As for getting “close to his value,” what do you think his value is? As for Matt Moulson, keep in mind that he’s playing for a team that doesn’t play much defense, much like Tampa Bay. Moulson is better than Teddy Purcell, but the fact that both don’t have to do much defensively should tell you a lot about why they’re thriving offensively. My main concern is losing Loktionov for nothing. I think Lombardi is one of the best general managers in the sport. But I believe that one of his biggest shortcomings is his failure to fully leverage the talent that he drafts. I’ve seen it now with Moller, Moulson, Holloway, Purcell, and Boyle. Granted, I think that the loss of Moller and Holloway had as much to do with poor decision-making on both of their parts that I believe that they may live to regret. I also think that I might have a problem with perspective in that I’m not accustomed to following a Kings team with a wealth of young assets. It’s quite possible that teams that have historically drafted better have had a problem in retaining their assets. I guess we won’t know for sure for at least another few years whether he is the real deal. But to answer your question about value, I believe Loktionov has a higher ceiling than the other players I mentioned and I would just hate to see the team get fleeced to the benefit of some other rival. Trust me…at this time, Loktionov’s ceiling isn’t high enough to be concerned about getting “fleeced,” as you put it. You’re over valuing him. You’re also over-valuing the other prospects that you mentioned. If you think they’re that much better than what the Kings got in return, you’d be mistaken. As I mentioned before, Purcell and Moulson benefit greatly from not having to worry about playing defense. The same could be said of Boyle with the Rangers, although not to the same degree. As for Moller and probably Holloway, I don’t see how the Kings were guilty of poor decision-making. And yes, you are on the right track regarding successful teams and their prospects. I’m excited for the possibility of Nicholls being attached to the team as a coach. Thanks for the nice break down of the past couple of days, Gann. Great story. Really sums things up nicely. There is a lot of upside to these picks. Some risk but this team is in a position now to go after a guy like the Russian. To get Ebert that late is great. I am glad to hear Nichols may be an assistant, and am also glad the power play is going to have a new look with Kompon gone. I cant believe that we are paying stoll more than Brown. The power play may be different next season, but Kompon’s departure won’t be the most important reason, given the fact that, according to Sutter, he wasn’t primarily responsible for it after Sutter took over. So many people have ignored that fact, even though it has been reported numerous times.